The cost of air-transportation has gone sky-high and everyone but the most well-heeled seeks ways to save a buck when flying. Kayak.com provides one avenue for doing just that with its free iPad app, Kayak Flights. Kayak Flights is simple to use. Just tap the From and To fields to enter your departure and destination points, choose the dates you’ll depart and return, set a few On/Off options (One-way, Include Nearby Airpots, Prefer Nonstop), set the number of passengers and flight class (Economy, Business, or First), and tap Search. In short order, Kayak Flights produces a list of available flights. The Only Way to Fly: Multiple panes in Kayak Flights on the iPad let you not only search for flights, but see a history of searches and view hot searches for flights originating in the airport you want to fly out of. You can filter these flights by number of stops, airlines, airports, flight times, and price. 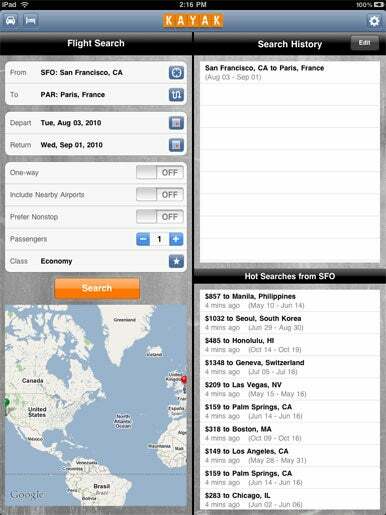 Tap a flight, and its particulars appear in a Flight Details pane with booking options in the Booking pane below. The booking options include not only the host airline but also such ticket brokers as Orbitz and CheapTickets.com. The price of the flight (excluding the trumped-up… er, discretionary charges) appears next to each entry in the Booking pane. Tap the provided link to one of these sites and you’re taken to the site where you can purchase your tickets. The application keeps a history of past searches—complete with dates—so that you can revisit those searches at another time. You can additionally e-mail links to the trip search as well as to a specific flight. And, in the search screen, you’ll see a list of hot searches based on the airport you’ve chosen to depart from. You’ll also find Find Cars and Find Hotels buttons at the top of the screen. Choose one and Kayak.com opens in Safari. Kayak Flights is very slick but it does have one failing. Unlike the Kayak.com Website, the app lacks a multi-city option. The app assumes that you’ll be flying into and out of the same airport. For example, it’s impossible to tell the app that you’ll fly from San Francisco to Hilo, Hawaii but depart from Kona (because it really is a big island and you want to see a lot of it on your vacation) to return to San Francisco. You can work around this by switching on the option to view nearby airports and then cobbling together the results of a couple of searches, but an option to tap the return flight and muck with its details (such as the airport) would be nice. Other than this one complaint, Kayak Flights shines. It’s a terrific and easy-to-use way to find the flights you want.